Streptavidin has fundamental biochemical interest owing to its extraordinarily high affinity (Ka ~10(14)) for the small vitamin biotin. My group at DuPont Central Research undertook the structure determination mainly to understand the biophysical factors that lead to this high affinity. We used conventional heavy-atom methods to phase the initial structures. 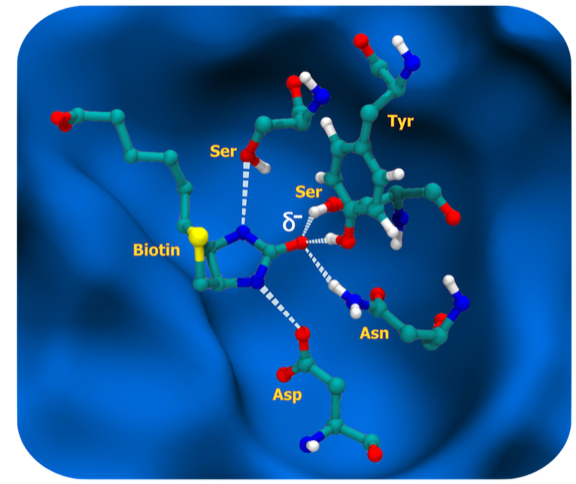 Our structure was published nearly simultaneously with the structure from Wayne Hendrickson’s lab, who used (the then) novel method of seleno-biotin MAD phasing to solve the structure. Streptavidin and its relative avidin are tetrameric proteins with D2 symmetry. Each ~15 KD subunit is primarily organized as an antiparallel beta barrel. Streptavidin finds wide application in biotechnology and biomedical applications owing to its high affinity and binding specificity for the vitamin biotin. Biotin can be readily attached to a wide variety of biomolecules, dyes, and surfaces, so providing the basis numerous applications that require high detection specificity and sensitivity in a heterogeneous biological environment. The vitamin biotin binds to streptavidin with femtomolar potency and is among the highest affinity, non-covalent, small molecule protein interactions found in nature. The biotin molecule is essentially completely buried in the streptavidin binding site and makes important hydrophobic interactions with indole side chains of two tryptophan residues. 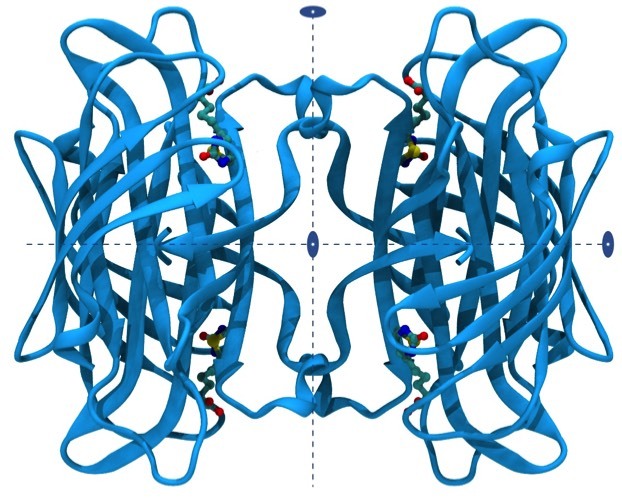 However, what makes the interaction unique is the situation of the biotin uriedo group, where the HN-C-HN pi electronic system is polarized by hydrogen bonds formed from two protein side chains, SER and ASP, buried in the low dielectric environment of the binding pocket. This in turn localizes negative charge on the biotin uriedo oxygen, which takes on evident sp3 hybridization character and is able to accept three hydrogen bonds from amino acid side-chain donors SER, TYR, and ASN in approximate tetrahedral coordination. This situation contrasts to the urea situation in water where the uriedo oxygen is expected to have sp2 hybridization and be able to accept two water hydrogen bonds. Consequently, the repolarization that occurs on binding seems to allow the formation of an additional H-bond to the biotin that it does not make in solution, accounting for the high enthalpy component of biotin binding to streptavidin. Repolarization effects, which also play an important role in the binding of many transition state analogs, are absent from computations that employ point charge models most commonly used in computational chemistry calculations to guide structure-based docking or design programs.